In Honor of Jim Moseley | Where We Remember Ufology's Supreme Commander! This site is a tribute to the life and times of the UFO field’s brilliant commentator and court jester. And, yes, we know that Jim never used a computer and never went online. We do, however, welcome your comments and your help in building this site. “”I am literally hoping I don’t outlast my money. Now that I have cancer, I think there is little chance of that. I no longer fear death, but I do fear misery, which might be coming soon. If for any reason life ever becomes unbearable (and so far it is okay! ), I will know just what to do. Summing up – my life has been almost unique…. I was handed over a million dollars when I was young, and gradually blew it – not on wild living but in stupid decisions in business and my private life. I have traveled all over the world, and seen and done many things that very few have seen & done. I had literally golden opportunities that I messed up. Please write to us: news@jimmoseley.com with your comments and suggestions. 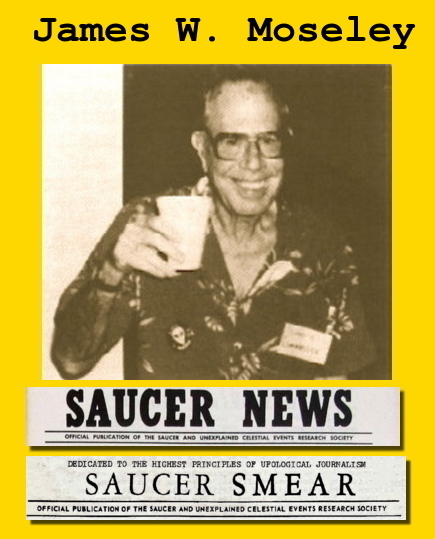 Jim Moseley, publisher of Saucer News and Saucer Smear, is remembered here in a number pages, feature articles and links. Note: This site was not created by and is not sanctioned by Jim Moseley’s family or estate, but is run by his friends. I listened to all of Jim’s episodes on the Paracast over the years. Jim was great, and his book — “Shockingly Close to the Truth” — was a wonderful read. Sadly, Amazon has only two copies left and still doesn’t have it in Kindle format. Barnes and Noble carries Jim’s book as an ebook, but how much longer will they be in business? I don’t know who holds the publication rights to Jim’s work, but getting Jim’s book into Kindle format would be a wonderful way to memorialize some of his life, his tales, and his interesting insights for a long time to come. I’d love it if the publisher, Prometheus Books, had extra stock or would consider a reprint. But it’s doubtful. Michael, thanks for your comments. I’ve tried contacting Prometheus about getting a Kindle edition published, but may have not reached the right person yet. In the meantime, they do still offer the book, and it is also kept in stock at Amazon, and there are also sources around for used copies. Hello Curtis, I applaud your site about Jim who was a friend of mine. I have some material on him I would like to send you if you will write to me at my email address. Thanks and I look forward to hearing from you in the future. I just listened to you on the Paracast, glad you did the show! Jim is dearly missed. I read Smear with great pleasure for many many years and my hardcover copy of “Shockingly close tho the truth” has a special place in my library. But I am rather appalled that his Saucer Smear volumes are still not freely available (in its entirety) for reading pleasure on the internet. UFO TV is still making money off it and this practice does not do justice to the legacy of a man that has written this with great dedication to the amusement of many. In all fairness, that’s up to UFO TV to figure out. They wouldn’t be the first company to make money off someone who is no longer with us. He was my grandfather, and he was an amazing man. Thank you for making this website in his honor. I’ve heard from several people about them happily receiving the final Saucer Smear.” Please thank Brittany for me. I just received my copy in the mail. It was a mysterious, wonderful surprise, like one last letter from a dear old aquaintance. Thank you. Never got a copy. Oh well.